1 (15-ounce) can unsalted cannellini beans, rinsed and drained or 1 cup cooked chicken breast. Heat a large saucepan over medium heat. Add oil; swirl to coat. Add carrots, leek, and celery; cook 5 minutes, stirring occasionally. Add salt, pepper, and garlic; cook 1 minute, stirring frequently. Add stock; bring to a simmer over medium-high heat. Add potatoes; reduce heat to medium, and simmer 8 minutes or until potatoes start to soften. Cook quinoa in chicken broth in separate pot, according to package directions. 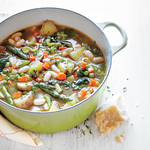 Add peas, asparagus, and beans; simmer 4 minutes or until vegetables are crisp-tender. Add spinach, thyme, and basil; cook 1 minute. Add cooked quinoa and chicken.